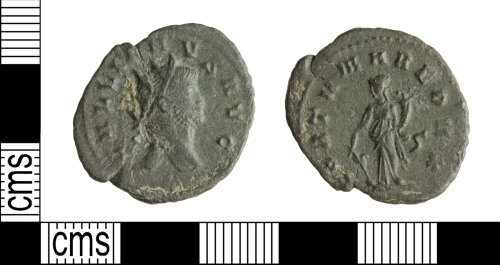 A copper-alloy Roman radiate of Gallienus, dating to the period AD 260-268 (Reece period 13). FORTVNA REDVX reverse type depicting Fortuna standing facing left holding rudder in right hand conucopiae in left hand. Rome mint, fifth series, Cunetio no.1215, RIC cf.193. Obverse description: Radiate head right. Reverse description: Fortuna standing facing left holding rudder in right hand and cornucopiae in left hand.